If you have dead, dying, diseased, damaged, leaning, falling, rotted or decaying trees on your Granite Bay property, tree removal may be a necessary option. An unstable tree can be a major safety hazard to people and property and should be assessed by a professional to avoid potential risk of injury, damage and liability. If there are issues that can be fixed with pruning, trimming, cabling or bracing, Destiny Tree Care can sometimes utilize these options before tree removal is necessary. Our experts in Granite Bay are happy to consult with you and provide a solution that will be in the best interest of both the tree, your property and yourself. Though removing a tree often becomes inevitable, below are just a few of the reasons why a tree should be removed as soon as possible. Call Destiny Tree Care at 916-370-0687 today! A tree that is dying should be removed as soon as possible. The longer you wait, the more unstable the branches become. Just like people, if a tree is diseased, quite often if one tree is diseased it will make others around it sick. A diseased tree should be removed as soon as possible. There are numerous reasons why a tree can become unstable. Including cracks in the trunk, large trunk cavities from pruning, decaying roots and if the tree was ultimately planted incorrectly. These trees are not safe and should be removed. 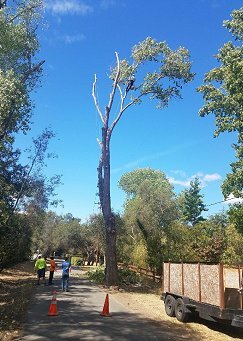 Removing a tree may also be necessary to provide clearance for power lines, homes, and new construction in Granite Bay, CA. At Destiny Tree Care, we specialize in promoting good tree health. We understand that healthy trees add to the aesthetic appeal of your Granite Bay property. However, sometimes a tree may be damaged or diseased and removing becomes a last option. It is essential that you hire the very best when you need a tree removed from your Granite Bay property. 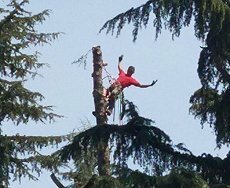 Destiny Tree Care has a trained and experienced team, and the equipment required to remove any tree in Granite Bay in a safe and efficient manner. We will always clean up the work site to preserve the integrity of your Granite Bay property. Contact Destiny Tree Care today for all of your tree removal needs in Granite Bay, CA. We invite you to continue your tour of our website. If you have questions or would like to schedule a consultation, please contact Destiny Tree Care at 916-370-0687. Thank you for your interest Destiny Tree Care. We look forward to serving you in the near future! Auburn, Carmichael, Citrus Heights, Colfax, Granite Bay, El Dorado Hills, Folsom, Lincoln, Loomis, Roseville, Rocklin, Rancho Cordova and Sacramento. Specializing in 24 hour emergency services, disease diagnosis and control, crown reduction, thinning, pruning, hedge lowering, shaping, removal, hauling and cleanup. © 2017-19 Destiny Tree Care. All rights reserved. Back to top Website Design by Brymels LLC.